Drew Hafford, 14, of Hermon shows how his invention, Diver Alert, works Saturday during the Invention Convention, part of the Maine Science Festival held at the Cross Insurance Center. Drew Hafford was scuba diving when he started to wonder about how he would summon help if he got hurt while underwater without a way to call 911 or communicate quickly with someone on the water’s surface. “I thought how very scary it would be to need assistance but not be able to get help,” he said Saturday during the Invention Convention, which was part of the Maine Science Festival held at the Cross Insurance Center in Bangor. 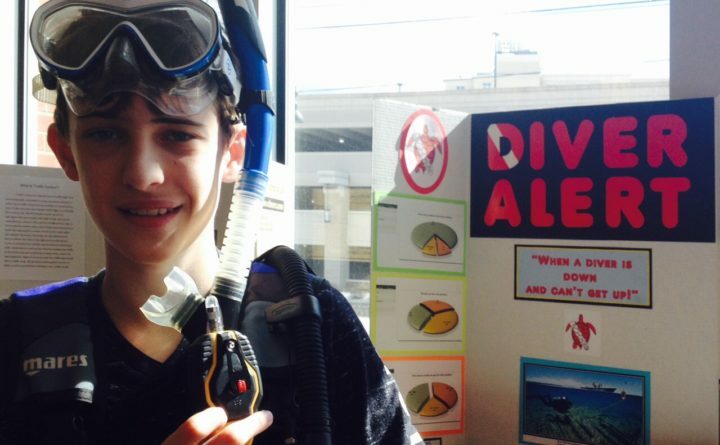 The 14-year-old’s idea turned into Diver Alert, a device scuba divers would be able to release if they were in trouble. It would float to the surface and send a location signal to a receiver on a boat. Drew, who lives in Hermon and attends the middle school there, wore his scuba gear Saturday as he explained how his device would work. Drew did not win the contest but is looking into patenting his Diver Alert but knows that is a long process. If he is successful in obtaining a patent, he would join a list of Mainers whose inventions have changed the lives of Americans. To be approved for a patent, an invention must be new, useful and not obvious, Knapp told the audience of adults and students. The first patent issued in the United States was signed by George Washington in 1790 to Samuel Hopkins of Pittsford, Vermont, for a product to improve how potassium fertilizers were made. The first invention from Maine still in use today most likely is the doughnut. Hanson Crockett Gregory claimed to have invented round pieces of fried dough with a hole in the middle in 1847 when he was a 16-year-old seaman in an effort to cook the dough more evenly, Knapp said. About 25 years later, John F. Blondel of Thomaston patented a device to improve doughnut dough cutters. The women highlighted 10 inventors, including Blondel, born in Maine and then asked questions of the audience, which was divided into teams. The team with the most correct answers won the chance to be the first in line for doughnut holes. The question about Chester Greenwood of Farmington, who famously patented earmuffs in 1877, was: how old was he when he got the idea for them? Answer: 15, close to the age of most of the student participants. Alvin Orlando Lombard was born in Springfield in 1856 and invented a steam-driven log hauler patented in 1907. It’s top speed was 5 miles per hour and it had no brakes but could haul up to 300 tons of wood over soft ground using tracks on wheels, Knapp said. How many Tyrannosaurus rexes does it take to equal 300 tons? Answer: 42 at an estimated 7 tons each. Drew Hafford hopes that his name will be added to the list of inventors from Maine in a few years. Kate Dikerson, founder and director of the festival, estimated Sunday that about 7,000 people attended the four-day event. Some of the most popular events were the exploration station, the program on the science of aging and the “Fire & Ice” show presented by Mad Science of Maine.